Was 1987 really the Second Summer of Love? In Britain we were always told that it was 1988 or 1989 or possibly 1990, but never 1987. Were the American and Canadian Generation Xers way ahead of comparative European kids, or are they duplicitously trying to trick the world into believing they pioneered a trend of hallucinogenic drug-fuelled rave culture that the rest of the world aped thereafter? 1987 was the year that The Lost Boys was released, it was the year that Guns N' Roses unleashed Appetite for Destruction, it was the year that President Reagan signed a secret order permitting covert sale of arms to Iran, but there is no evidence that one can identify suggesting 1987 had anything to do with heightened levels of love and euphoria in the North American continent. We’re being duped it seems. 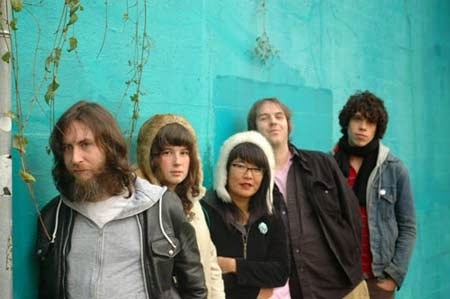 Vancouver’s Pink Mountaintops are perpetrating a demented fiction whereby they’re laying claim to a cultural event that doesn’t belong to them and they’re getting their dates all wrong. We’ve caught them out. It’s another example of Young Americas preying on feeble Old Europe. Gosh, the dishonesty.